After our lazy night the night before, we were ready to visit Animal Kingdom bright and early! I have heard mixed reviews about Animal Kingdom with young kids, but it’s something I really would recommend. Magic Kingdom is obviously #1, but Emmie really enjoyed Animal Kingdom. There are things for younger kids to do and it wasn’t overwhelming…kind of like visiting a really big, really fun zoo. We enjoyed it! We didn’t have fastpasses for Animal Kingdom (more on that later), so we kind of had to be strategic with what we did this day. We tried to hit up the more popular rides as soon as we got there, which was shortly after opening. This park was abnormally slow this day, so it worked out really well that this is the day we didn’t have fastpasses. As soon as we got there, Emmie and Noah went to Kilimanjaro Safari…it isn’t recommended for pregnant women, so I sat this one out. It’s one of the more popular attractions at Animal Kingdom, so we did it first thing (and the line was really short). It’s kind of a long ride (maybe 20 minutes or so), but Noah said they got to see great animals and Emmie loved it. After that, we headed for DINOSAUR! It’s another one that pregnant women can’t do, so I waited on Noah and Emmie to ride this one. Please don’t think I’m a bad mother for this…but this picture CRACKS ME UP. Noah said this was pretty indicative of the ride…him making sure that a terrified Emmie wasn’t freaking out. She said it was kind of scary for her, so maybe this one isn’t for younger kids. After that, Emmie and I headed for The Boneyard (just a fun play area for kids…think Honey I Shrunk the Kids playground, but for Animal Kingdom) while Noah did the single rider line for Expedition Everest. (Yes, Noah is one of those people in roller coaster pictures.) He was able to ride this twice within like 15 minutes with the single rider line – it’s a great option if you’re the only one that can ride a really busy attraction. I know Expedition Everest and Rock n Roller Coaster at Hollywood Studios has it, and I think Test Track at Epcot has it. …and then did Triceratop Spin while we were waiting on Noah. Just an FYI – Triceratop Spin is in a carnival area that looks really fun, but is a “pay to play” part of Animal Kingdom. The games average $3-4 each..we steered clear of that, because there are lots of games and that adds up quickly! After that, we met up with Noah and went to the first showing of Finding Nemo: The Musical for the day! The line was kind of ridiculous for this, and I’m not sure why…we walked right in getting there at the last minute and had great seats. This one was really cute and one of the biggest things I’d recommend for families with young kids. It’s just basically a musical retelling the movie, but it’s really engaging. We went to “It’s Tough to Be a Bug” after Nemo…and Emmie HATED IT. It’s a little intense, and some of the 3D parts were too much for her. There’s also a part at the end that feels like bugs are crawling around you. Maybe an older kid that’s into bugs would like this one, but not for Emmie. After we left, Emmie had to (HAD TO) find a kiosk that had one of these books that are handed out at Animal Kingdom. It’s really for older kids, but it’s a cute idea…you can earn badges (stickers) for doing things around the park. Emmie saw another child with one and BEGGED to get one, so we found a stand on the way to lunch. It ended up being a great way to fill the time when she was in the stroller! Next, we had a reservation at Tusker House for lunch! This was another character meal, and offers African/Middle Eastern buffet food. The food was really good, probably my favorite as far as the buffet meals. They also offer “kid food” (corn dogs, mac and cheese, etc.) if you have a child that isn’t super experimental in the food department. The restaurant was really busy. We waited around 15 minutes for our table, which was by far the longest wait of the trip, and there were a ton of people inside. We still got to see all of the characters within about an hour though! After lunch, we took the Raftiki’s Train to the Raftiki’s Planet Watch area. It wasn’t my favorite area of the park…much more museum than theme park. …and went to the Affection Section. There was really only one animal out for the petting zoo, so overall, not worth taking time out of your day. Of course, we had to get a picture in front of the tree! We let Emmie get a popsicle (amazingly, this shirt came clean when I washed it) and headed back to the hotel at maybe 3:00. It was starting to rain and we were really done with everything we wanted to do! I would love to have seen the Lion King Musical, but a little bit of rest time was much more important to us at this point. 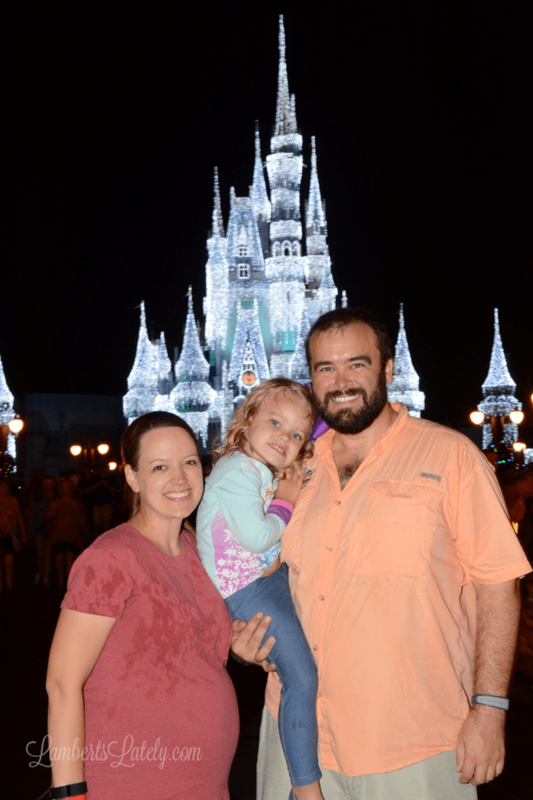 That night, Magic Kingdom had Extra Magic Hours (only available to resort guests) until midnight, so we decided to take advantage and knock out a few things we wanted to do without the huge waits! I would totally recommend doing this if you have the opportunity. It made the next two days at Magic Kingdom much less stressful…we were able to take our time and repeat a lot of rides that Emmie liked instead of stressing about fitting everything in. We didn’t have Fastpasses at Animal Kingdom that day because I was able to get Fastpasses to meet Anna and Elsa that night! You can’t book fastpasses at more than one park per day (even if you’re under the total number allowed for the day), and Anna and Elsa was much harder to get than anything at Animal Kingdom, so I made the decision to just wing it at Animal Kingdom…it worked out really well. If you’re trying to get harder fastpasses like Anna and Elsa, I’d highly recommend this site…it’s a real-time fastpass monitor that tells you when fast passes for a party of 2 or 4 are available for a certain day. I checked that daily and finally found Anna and Elsa a few weeks before our trip. They weren’t easy to get, but they were so worth it! Noah and Emmie did The Barnstormer (her favorite)…she got one of the red passes they use to monitor wait times, and she thought it was such a big deal! They also went to the carousel as soon as we arrived. This pregnant lady doesn’t do carousels after a bad experience a few months ago, so I waited on them to finish. I did join them on Dumbo though! Since we had two extra fastpasses to fill at Magic Kingdom, we met Cinderella and Rapunzel. Emmie was so starstruck and had the cutest conversations with them! This is probably my favorite picture of the whole trip. I just love the love in this one! The wait for Philharmagic was really low when we walked out, so we stopped by that. It’s a cute 3D show that’s kind of a mash-up of all of the Disney hits! As we walked out, the fireworks were starting right above us. It was pretty cool to be right under them and have a great view of the castle! We had a few minutes before our Anna and Elsa fastpasses, so we went to Columbia Harbour House for dinner. It was good, not great… I was honestly expecting more, but not bad at all for a Quick Service meal and I’d still recommend it. I hate that I didn’t try the lobster roll…it’s apparently available at dinner by request, but I didn’t know that! After dinner was the big moment! Emmie was so excited to meet Anna and Elsa. So glad we got to meet them…the lines are kind of crazy if you don’t have a fastpass, so if you can get your hands on one I’d really recommend it! Emmie even made a coin to remember the moment after we left. After that, Emmie and Noah did the teacups once (they are way too intense with the spinning on those for me). We also went on The Many Adventures of Winnie the Pooh…I had a fastpass for this the next day, but the wait was really low! It’s a cute ride for smaller kids (I’d say 2-5). They also have fun games to play if you’re in the standby line, so the wait isn’t terrible. We went across the park and did a few things in Adventureland/Frontierland too…Emmie and Noah went on Big Thunder Mountain Railroad (with little to no wait) and we all did Magic Carpets of Aladdin! They both ended up being favorite rides. How great would this picture be if I had realized that THE CAMEL AT MAGIC CARPETS SPIT ALL OVER US? (It’s water, but still.) I seriously may photoshop it out because I love the picture so much. The castle is beautiful this time of the year! We ended up shutting down the park at about midnight…definitely not planned, but I’m glad we stayed! Emmie held out really well and didn’t fall asleep until she was in the stroller on the way home. Considering we basically did two full days of parks in this day, she held out so well and was in a really good mood until the end! We had full intentions of taking the bus home , but y’all…ok. We had a great experience with the buses until this night. We got in line after leaving the park and were easily 3-4 bus rides back in line. There was a bus running maybe every 30 minutes at this point, and we were exhausted, so we took the ferry to the TTC and got a cab. I think it was the best $20 we spent all trip! (More on transportation in my Q&A/tips post.) Lesson learned: buses are great as long as you aren’t trying to leave the park at close! Next week I’ll finish up the trip with our last two days at Magic Kingdom!